Collins Booksellers - Chicken Coops: Beginner's Guide to Planning and Building Your First Chicken Coop to Become Self-Sufficient by Tommy Jacobson, 9781386628842. Buy this book online. Have you ever wanted to have 100% free-range eggs and poultry? Want to experience the joy and excitement of harvesting eggs and keeping your own flight of chickens? Do you have a knack of carpentry and building projects? Curious on how you can build your own chicken coop at your backyard? If you answered yes to any of these questions, then this book is for you! The chicken coop movement is becoming more popular than ever and it is rewarding coop owners with fresh, safe and well-deserved eggs and chicken. Your goal of achieving a healthy lifestyle is becoming more and more difficult with food items that are being mass-produced using dangerous methods. One way that you can be entirely sure that what you are putting in your plates is completely safe is by sourcing the ingredients yourself. How is this possible? 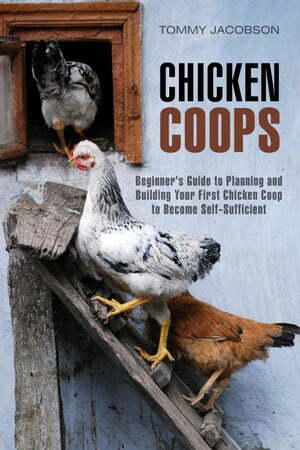 At least for poultry side of your cooking, chicken coops are the answer! I want to share with you how I have become more and more self-reliant and sure of the food that I cook and serve to my family, friends and loved ones. Building a chicken coop is one of the most enjoyable and rewarding activities that I have ever done! Once you start planning and building your chicken coop and once you start bringing in home your first flight of chickens, then you are one step closer to achieving food independence.